These mushrooms are the most well known in America and Europe, (they also happen to be the same species as crimini mushrooms, baby portabella, baby bella, mini bella, button mushrooms, brown mushrooms and the portabella mushroom). They range from creamy white to beige and are good either raw or cooked. Freshly picked white mushrooms have closed caps that fit closely to the stem and range in size from button to jumbo. Baked in gratins, Pan roast, sliced or shaved raw in salads, sauté, commonly used in soups, ragouts, and sauces. 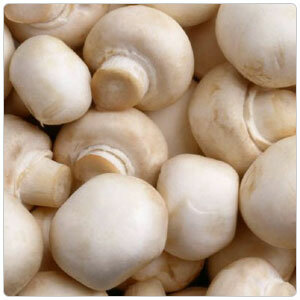 Mushrooms are a huge group of edible fungi that are grown, picked and eaten in almost every country around the world. Mushrooms come to us as cultivated, grown in some manner by man, or, as wild, originating in wooded forests. Interestingly enough, cultivated mushrooms do not grow in the wild and wild mushrooms have yet to be successfully cultivated by man.